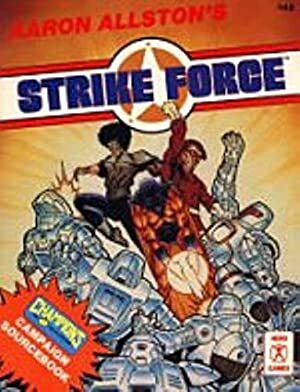 Aaron Allston’s Strike Force was a super-hero RPG supplement published in 1988. It presented his long-running Champions campaign and was packed with sophisticated advice and methods for game masters and players. For many super-hero role-players of that time, it was a landmark work. La Panthère is one of the heroes of the titular Strike Force super-hero team. Real Name: Catherine Marie Quarry (née Beauchamp). Other Aliases: “La Panthère” is a tad flat and generic, and thus not very French. Personally I would have gone for “Mistigri” (an old-fashioned slang term for a grey cat, with a loose implication that the animal is a jinx, like a black cat. Grey cats are also associated with the night and anonymity due to a folk saying). Known Relatives: Matt Quarry (a.k.a. Richard McLean, a.k.a. Phosphene) (husband), unnamed mother-in-law (deceased). Base of Operations: Strike Force Mansion outside of Rutherford Oaks (North Shore, Long Island). Eyes: Brown Hair: Very dark brown. La Panthère is primarily a tireuse (a savate expert), and an intrusion and security specialist. 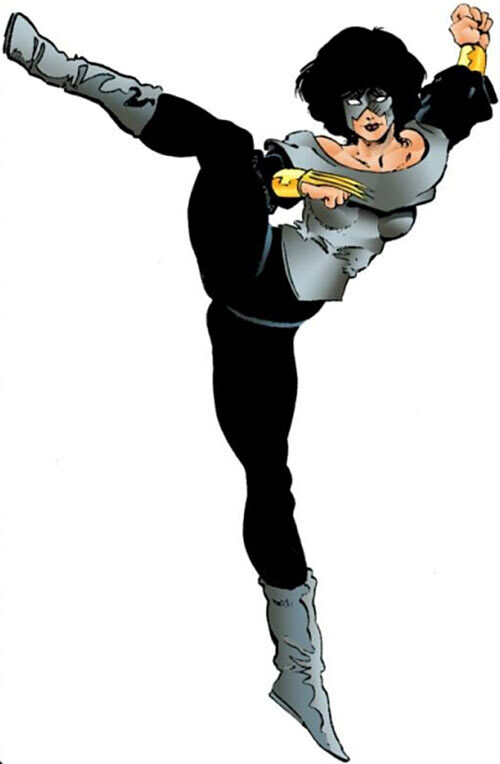 Her kicks-heavy combat style is powerful, and she’s fast, agile and acrobatic. Enhanced strength (lifting 1.5 tonnes) and peak human durability. Infrared vision, though that leaves her sensitive to sudden powerful lights. These enhancements were done using artificial hormones, backed by genetic engineering so they gradually became permanent and maintenance-free. Though it took months and various incidents, Beauchamp eventually mastered her enhanced strength. As a Strike Force member she has a discreet radio tracer and communicator, and is considered a deputy by New York state police forces. 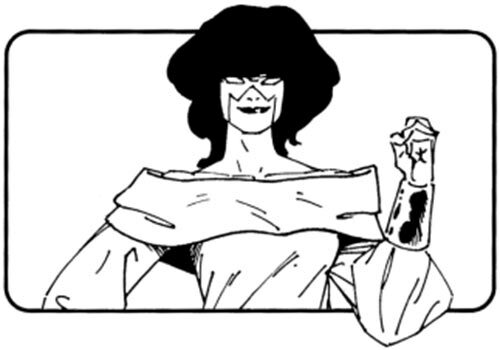 Her costume is lightly armoured, and she drives a Pontiac Trans Am that can change its colours and licence plates. La Panthère is equipped with a cerebral implant making it harder to telepathically assault her, and in particular to mind-control her. This is to prevent a repeat of the Overlord incident, which left her psychically vulnerable. As a French college student, Catherine Beauchamp was rescued from a terrorist attack by a super-hero. Inspired by his example she persuaded him to train her in combat and investigation. She eventually became a super-heroine, La Panthère. In 1980 she moved to the US and applied for an American citizenship. Her goal was to study the methods of more experienced American super-hero teams. She joined such a team, the Lightbearers. However, the Lightbearers soon discovered a base of the archvillain the Overlord. Their overconfident attack was a disaster. One Lightbearer was killed and Beauchamp was captured. Overlord mind-controlled her into being his bodyguard, and experimented to give her powers to reinforce her feline theme. During the Autumn of 1981, the super-hero team Strike Force had their second clash with the Overlord. They fared much better than the Lightbearers. During the fray the brainwashed Panthère nearly defeated Phosphene. Team member Shiva landed a coup de grâce on the unconscious Panthère. This infuriated Phosphene and resulted in a fight, whilst team member Lightrune saved La Panthère’s life with his healing power. Shiva’s callousness caused a permanent rift with Phosphene. Strike Force would eventually split. Shiva became (as “Sai” after faking his death for unrelated reasons) the leader of the new team, the Shadow Warriors. Phosphene, impressed by La Panthère, had her mind control implant removed and arranged for allied mystics to partially heal her mind. The two began a relationship and would eventually marry. In 1982, Phosphene disappeared in space to find the home world of his near-human species. La Panthère formally joined Strike Force to locate him. She also became a literary agent to manage her husband’s oeuvre while he was missing. The couple was eventually reunited and a leader of the Blood, Phosphene’s species, was destroyed to curb the threat they posed. Phosphene had been brainwashed for a time and acted as the villain Phantasm, but he was restored by alien relatives. By this point the Strike Force was rather famous, and had its own mansion to serve as a base (as a gift from the retired super-hero Defender). They repeatedly fought hostile aliens, as well as Earth villains. Of note among the latter were the Reapers, who developed a particular enmity toward La Panthère. 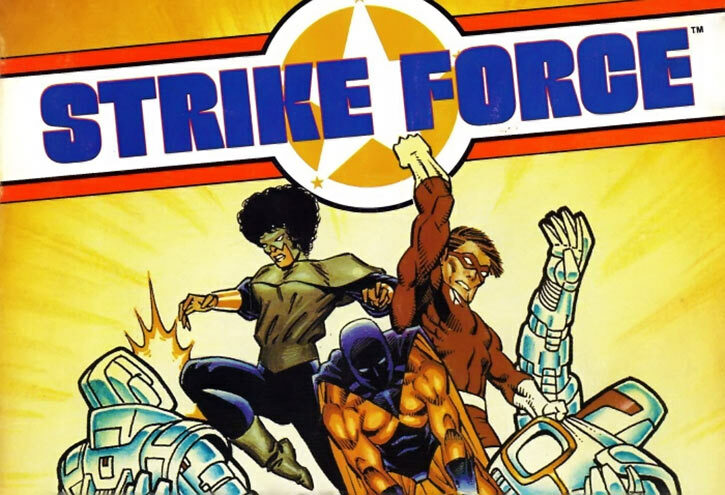 Strike Force also defeated the Governor, a shadow power that was preventing the spread of super-technology. In late 1987 and early 1988, the Darklord of the other-dimensional Chaos Zone invaded Earth with his armies. The Strike Force was eventually able to venture into the Chaos Zone and take down the Darklord. Earth having been badly damaged, the Strike Force assisted in the reconstruction efforts. This is the point where the Strike Force supplement was written. Beauchamp-Quarry speaks fluent English with nary an accent. As La Panthère she has a far more noticeable French accent, to help protect her secret identity. Catherine fights to save lives and protect people. She chose her code name due in part to certain cat-like traits of her. She’s hedonistic, likes to stalk and hunt, and has a wild streak to her. The mind control abuse by the Overlord left her diminished and unsure of herself. It’s unlikely that she’ll ever recover. She finds comfort in the Strike Force basic arrangement – members generally work alone but they’ll assemble whenever reinforcements are needed. In combat, La Panthère is specifically partnered with Phosphene and Lightrune, two of the team’s founders. They keep watch on each other and train to work together. Strike Force has various code words for canned tactics and manoeuvres, and a good track record in using them. For instance “blue dot !” means that somebody is about to unleash a flash attack and La Panthère in particular should shield her eyes. Expertise (Security, Literary agent), Headquarters (Expansive – Strike Force Mansion), Language (French), Slow Ageing. Strike Force (High), Dryad of the Lightbearers (High). Dependent (Phosphene, 0 points), Partial Attack Vulnerability (-1CS RV vs. bright lights), Police Rank (considered a deputy in the state of New York, 1 pt), Secret Identity, Traumatic Flashback (events reminding her of her capture by the Overlord). LIGHTLY ARMOURED COSTUME [BODY 05, Blunting: 04]. CLAWED BRACERS [BODY 08, EV 03 (07 w/STR, 09 w/Martial Artist)]. MIND DEFENCE IMPLANT [BODY 01, Mind field (Self only): 02, Iron Will: 03]. RADIO/TRACER [BODY 01, Radio communications: 06]. 1980s PONTIAC TRANS AM [STR 04 BODY 06, Colour (Self only): 06, Running: 07, Insta-change (licence plates only), R#02]. Source of Character: Aaron Allston’s Strike Force. Helper(s): Darci. The colour version of the illustration was found on this thread . It’s a coloured version of the one in Strike Force, colourist unknown. Writeup completed on the 16th of June, 2016.